2014 Rock and Roll Hall Of Fame inductee and former KISS guitarist Ace Frehley will perform on The Tonight Show Starring Jimmy Fallon next Tuesday, August 12, 2014, sitting in with THE ROOTS for the show’s entirety. Additionally, a one time only in-store appearance and signing at the Best Buy in Union Square, NYC will take place Tuesday August 19th at 6PM. Fans will be able to get their own copy of Space Invader signed by the Spaceman himself. 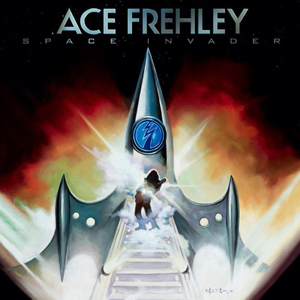 ACE FREHLEY will release Space Invader, his first new solo album in five years, via Entertainment One Music (eOne Music) on August 19th. The album features nine brand new original songs, including the first single, “Gimme A Feelin'", as well as a cover of STEVE MILLER’s classic rock staple “The Joker”. Frehley also tapped long time friend and artist Ken Kelly to create the album art for Space Invader. Kelly created the iconic cover art for two of KISS’s best selling LPS, Destroyer (1976) and Love Gun (1977).